Observation - Hawkmoth caterpillar - UK and Ireland. Description: Lime green caterpillar, approx 60mm, 7 yellow stripes, yellow 'tail' yellow stripes on head. 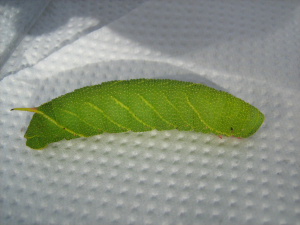 Lime green caterpillar, approx 60mm, 7 yellow stripes, yellow 'tail' yellow stripes on head.